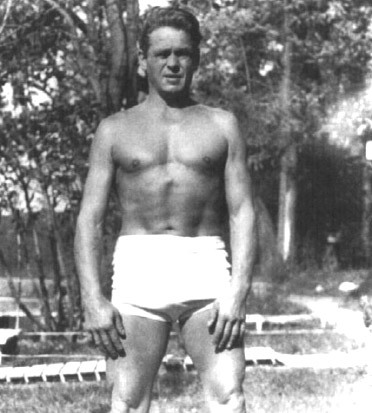 Joseph Pilates, born in Germany, sought ways to develop his frail body ever since he was a child. Having asthma, rickets and worrying about contracting tuberculosis, he began bodybuilding. By the time he was a teenager, his body was so well sculpted that he was asked to pose for anatomy charts. He studied various exercise disciplines including the Martial Arts, Yoga, and Tai Chi and eventually became a professional Boxer, Gymnast, and Skier. Realizing that the Eastern fitness methodologies emphasized relaxation, breathing, and suppleness, and the Western methods focused on competitive strength and endurance, Pilates sought a way to combine the best of both regimens in order to create one ideal exercise that would "challenge each persons physical capabilities, correct muscular imbalances, and create mental and physical harmony." At the age of 32, he went to England to train as a professional boxer. He taught self-defense, wrestling and worked as a circus performer. While being held intern with other German nationals at the outbreak of WWI, he began applying and refining his method which at that time he called "Contrology". Later, he was transferred to the Isle of Man and was asked to help rehabilitate injured soldiers. He experimented by attaching bedsprings to wheelchairs and hospital beds, introducing a new form of rehabilitation to the bedridden patients. (This concept led to the development of the "Cadillac", the first of 18 pieces of equipment Joe invented in his lifetime). In addition, he began teaching his mat exercises to fellow internees to strengthen and align their bodies, improve lung capacity, and correct various imbalances in their bodies. As a result not a single one of them that followed his regimen was affected by the influenza epidemic that killed thousands in 1918. After the war, Pilates returned to Germany where he continued training the Hamburg Military Police in self-defense and physical conditioning. In 1926, he chose to move to the U.S. On the journey he met Clara, a nurse, who became his future wife and partner. They opened a studio in NYC (939 Eighth Avenue) and Pilates continued refining his method into what we know today as "The Pilates Method."